Female comedians such as Gale Henry, Louise Fazenda, Colleen Moore, Constance Talmadge were wildly popular during the silent film era, appearing in countless motion pictures and earning top salaries, and yet their names have been almost entirely forgotten. As a consequence, recovering their history is all the more compelling given that they laid the foundation for generations of funny women, from Lucille Ball to Carol Burnett to Tina Fey. These women constitute an essential and neglected sector of film history, reflecting a turning point in women’s social and political history. 5- And the final chapter of Comic Venus brings readers to understand comediennes and their impact on silent-era cinema, as well as their lasting influence on later generations of funny women. 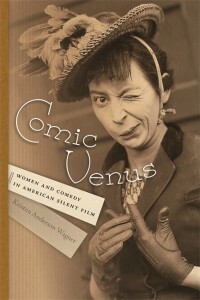 Exploring the overlooked contributions made by comediennes in American silent film, Comic Venus reveals the thoroughly researched histories of these women and their groundbreaking movements in comedy and stage.